The Royal College of Music (RCM) awarded the Milstein Medal to Nikita Abrosimov, a young pianist from Russia with a burgeoning international career. 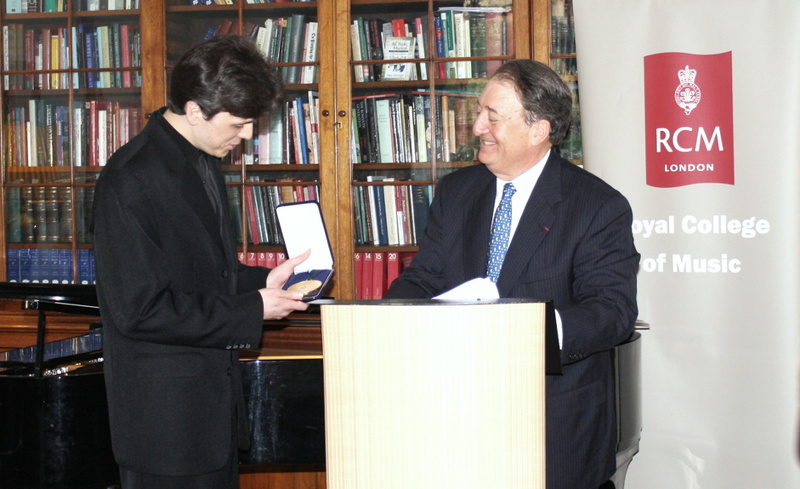 Howard Milstein presented the Medal, after which Mr. Abrosimov played Chopin’s Barcarolle and preludes by Sergei Rachmaninov for an invited audience in the Director’s Rooms. An enthusiastic reception greeted Mr. Abrosimov’s performance. RCM Director Professor Colin Lawson thanked Howard and Abby Milstein for their support of “one of our most outstanding pianists, Nikita Abrosimov, and for shining a light on the talented young musicians who chose to come here from around the world. I am most grateful to the Howard and Abby Milstein Foundation for their generosity over the years through the William Smith International Performance Scholarship and the Milstein Medal, and look forward to many more years of working with you to nurture musical talent.” The Milstein Medal has been awarded annually since 2008. Nikita Abrosimov’s studies began in Nizhny Novgorod, Russia, and continued in the United States at Indiana University under Alexander Toradze. Mr. Abrosimov studies at RCM with Professor Dmitri Alexeev. He won the 2011 World Piano Competition, held in Cincinnati, and the next year he was awarded the Gawon International Music Society Prize in Seoul (South Korea). Mr. Abrosimov has appeared at the Mariinsky Theatre’s International Piano Festival and the Stars of the White Nights festival, performing with the Mariinsky Orchestra under the baton of Valery Gergiev. He has also appeared at the Teatro alla Scala in Milan and given recitals in New York (Alice Tully Hall) and Seoul (Yongsan Art Hall). The Royal College of Music was founded in 1882 by the then-Prince of Wales (later Edward VII), and has trained some of the most important figures in British and international music life. Noted graduates include composers Gustav Holst, Ralph Vaughan Williams, and Benjamin Britten; conductors Leopold Stokowski, Sir Colin Davis, and Sir Roger Norrington; singers Dame Joan Sutherland, Sir Thomas Allen, and Alfie Boe; and instrumentalists James Galway and Julian Lloyd Webber.